Apple has been hard at work this year. First it was the third-generation Apple iPad, then the iPhone 5, and now, only half a year removed from its last iPad event, Apple is turning loose two new tablets—the Apple iPad (4th Generation) and the Apple iPad mini. The former was more of a surprise, but it brought very little new capability to the table, aside from a beefed-up processor and the new Lightning connector. Still, it will likely inherit the top spot for large-screen tablets. The iPad mini, on the other hand, offers a new form factor for Apple, but it will have to prove itself against established small-screen tablet players like Google and Amazon. 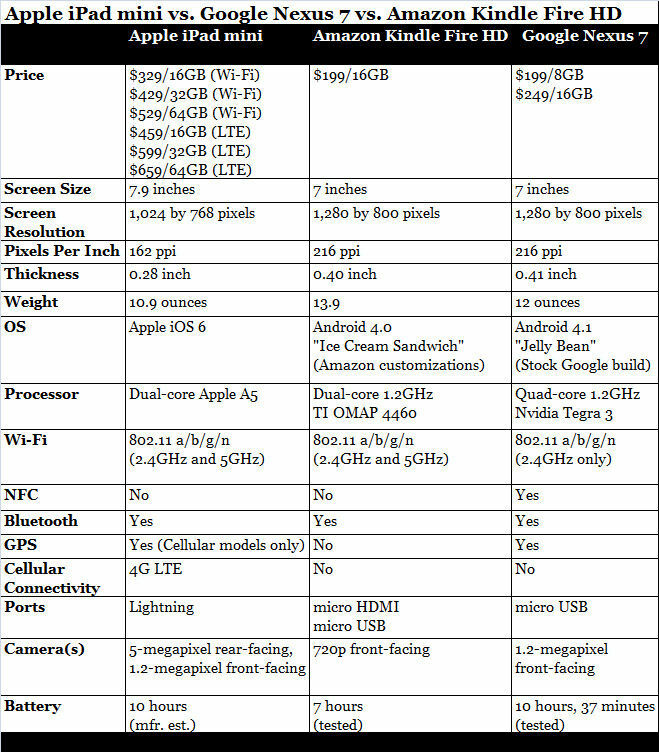 So how exactly does the new petite player stack up against the Google Nexus 7 and Amazon Kindle Fire HD? Read on for a side-by-side breakdown. This isn't exactly an even match, as the iPad mini is actually larger than most small-screen tablets. Apple has shunned the standard 7-inch screen size, opting instead for a 7.9-inch screen. On a pure spec basis, the 7-inch 1,280-by-800-pixel screens on the Nexus 7 and Kindle Fire HD are actually significantly sharper than the 7.9-inch 1,024-by-768-pixel screen on the iPad mini. That's 216 pixels per inch on the Android-based tablets versus 162 pixels per inch on the iPad mini—certainly not Retina friendly. So why stick with the same resolution found on the original iPad and iPad 2? Well first there's the issue of app compatibility, and the uniform resolution ensures that a vast majority of existing iPad apps will look great on the iPad mini. Also, by Apple's estimates, that 0.9-inch difference in screen size amounts to about a 49 percent larger Web-surfing area in portrait mode and a 67 percent larger area in landscape mode—something Apple thinks consumers will value more than pure pixels per inch. Keep in mind, however, Apple accounts for UI elements of Android in that calculation. Apple products have always featured stunning designs with high build quality, and we expect the iPad mini to continue that trend. At 0.28 inches thick and 10.9 ounces, it's also significantly thinner and lighter than the Nexus 7 and Fire HD. I'm a sucker for unibody brushed aluminum builds, so I'm banking on the iPad mini feeling like a more luxurious product, but to be fair, the Nexus 7 and Fire HD both feature solid builds that earn top marks in the Android world. Powering the iPad mini is Apple's dual-core A5 processor. It's the same chip found on the iPad 2, but it's not clear if these are clocked at the some speeds. The Nexus 7 uses Nvidia's quad-core Tegra 3 processor, which has proven to be a more than capable mobile powerhouse—in fact it's being used in Microsoft's new Surface RT tablets. Amazon opted for the TI OMAP 4460 chip in its Kindle Fire HD, which was beaten in pretty much every one of our benchmarks by the Tegra 3 chip. 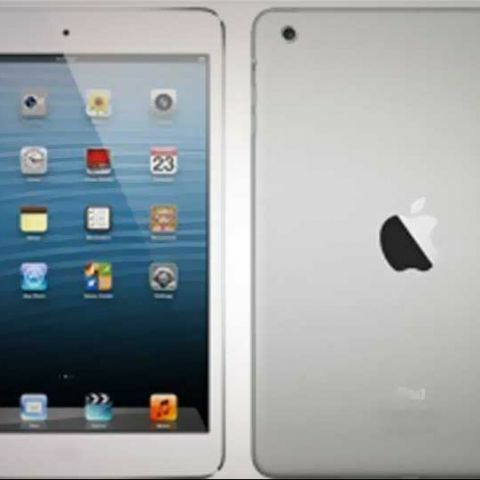 The iPad 2 was no slouch in the performance category, but it remains to be seen how that carries over to the iPad mini. If history is any indication, however, Apple's products have always lined up well with Android counterparts, despite having fewer cores and lower clock speeds. That brings us to our next point of comparison: Software and apps. Apple's iOS has always been a strong point, with a fluid and stable user experience. It lacks some of the open-ended customizability offered by Android, but it has always been the more polished mobile OS. Amazon's take on Android focuses on making it easy to consume content—specifically from Amazon's own stores. It too loses out on the customizability of Android, but it's an easier device to pick up and use right away. The Nexus 7 uses a pure build of Google's latest Android 4.1 Jelly Bean software, with its smooth UI thanks to Project Butter and access to new features like Google Now. The biggest difference on the software side will be app selection. Google may tout 500,000 apps in its Google Play market, but only a minute fraction of those are actually built for use on tablet screens. This is the iPad mini's primary advantage—right out of the box, thanks to its standard resolution, the mini will have access to the more than 275,000 apps made specifically for the iPad. Then, of course, there's the price. At $329 for the iPad mini, Apple is making a clear statement that it is not shooting for the low-end. Does it do enough to justify the $130 price difference between the iPad mini and the $199 Nexus 7 and Fire HD? We'll know for sure when we get the device in our labs for more extensive testing. Until then, let us know which tablet you think reigns supreme in the small-screen tablet world.